Alcoholic beverages are harmful when consumed in excess. Excess alcohol alters judgment and can lead to dependency and a great many other serious health problems. 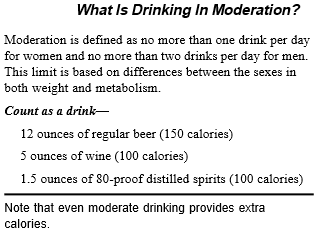 Taking more than one drink/day for women or two drinks/ day for men (refer to the image below) can raise the risk for auto accidents, other accidents, high blood pressure, stroke, violence, suicide, birth defects, and certain cancers. Even one drink/ day can slightly raise the risk of breast cancer. Too much alcohol may cause social and psychological problems, cirrhosis of the liver, inflammation of the pancreas, and damage to the brain and heart. Heavy drinkers also are at risk of malnutrition because alcohol contains calories that may substitute for those in nutritious foods. If adults choose to drink alcoholic beverages, they should consume them only in moderation—and with meals to slow alcohol absorption. Drinking in moderation may lower risk for coronary heart disease, mainly among men over age 45 and women over age 55. Moderate consumption provides little, if any, health benefit for younger people. Risk of alcohol abuse increases when drinking starts at an early age. Individuals who plan to drive, operate machinery, or take part in other activities that require attention or skill. 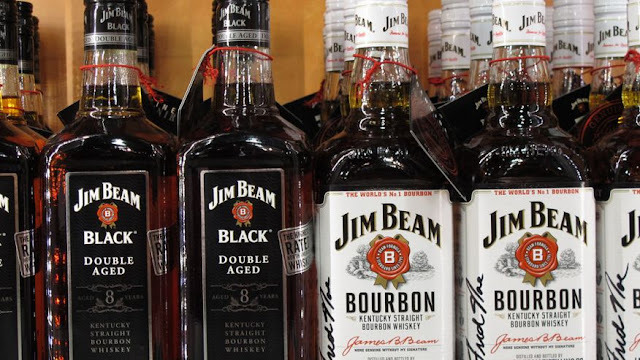 Most people retain some alcohol in the blood up to 2 to 3 hours after a single drink. Individuals taking certain prescription or over-the- counter medications that can interact with alcohol. If you take medications, ask your health care professional for advice about alcohol intake, especially if you are an older adult. If you choose to drink alcoholic beverages, do so sensibly. Limit intake to one drink/day for women or two/ day for men, and take with meals to slow alcohol absorption. Avoid drinking before or when driving, or whenever it puts you or others at risk.